Yesterday, in a headline for FP, I celebrated the departure of Rex Tillerson, former Secretary of State and the man who ushered in the brave new age of the Boy Scouts of America. But it’s really a mixed bag. However, with the cabinet positions, aides, and so forth, the turnover is a mixed bag. We seem to lose one deep state, globalist idiot only to have another step right in to take his place. Seems like it spreads. The newly nominated Sec. State, replacing T-Rex, in the former Director of the CIA. Do we really want the head of secret police/paramilitary force representing us to the world? Might that not send a mixed message? The new, nominated Director of the CIA is the former Deputy Director, Gina Haspel. If you’ve never heard of her, that’s probably because you watch America’s mainstream, lamestream, report no real facts media. Stop that. Get all your news and entertainment here! She ran the notorious CIA “black site” in Thailand. You’ve probably not heard much about that. It was (is) only one of the many places where the USA, beacon of virtue, engages in illegal torture of enemy combatants (defined as whomever the President says is…). This has been standard operating procedure under the current and past two administrations (Duuuuuuh-wa, no hope and no change, MAGA). This practice and those like would, if conducted by any other government, constitute actionable offenses against humanity. There has been limited legal action already. The international community has little sway over the US with its thousands of operable nukes. And there is NO justice left in America’s courts. So, what sent Nazis to the gallows (on trumped-up, ex post facto charges and no due process at all), the US gets a pass on. Exceptionalism or something. And, even honest CIA killers admit this hideous treatment of prisoners doesn’t work. Abu Zubaydah, in US “custody” for something like 15 years, with no rights, and no hope, was horribly battered and abused only to have it discovered he knew nothing and was not a threat. Still at Club GitMo though. “Thems tarr-ists,” the unwashed roar, “who cares?” What part of “whomever the President says” don’t they get. It can be and has been US citizens. I’ve been asking of late why Trump doesn’t apply such Draconian “justice” to the globalists, deep staters, and treasoners. Why not release the tortured, no threat, know-nothings, and make room for bankers, Congress Critters, judges, and people like Gina? You know, real threats who’ve actually done harm. Instead Trump does the opposite, continually appointing rather than prosecuting. Palm Beach isn’t located in Syria, Iraq, Iran, Libya, nor North Korea. And Johnson looks like a shaggy, disgruntled American everyteen. We don’t have to look that far for our boogeymen. Justice in Amerika. New Yorker. The vote had to be of the unrecorded, oral variety as I can’t find reference to it. Congress frequently avoids such disclosure. Why would anyone want to readily know how his Senator voted on something anyway? There are reasons a rational man would oppose such a “common sense” law. Anyway, support for this version of gun control is being hailed as some sort of crack in the GOP/NRA wall against a safer America. Republicans find it much easier to explain enacting gun restrictions to constituents devoted to the Second Amendment if they can frame their position as an act against terrorism. WASHINGTON – U.S. Senator Lindsey Graham (R-South Carolina) today made this statement after voting in support of the Collins amendment to prevent terrorists from buying guns. The amendment survived a procedural vote, 52-46, and remains eligible for a final vote. “At the end of the day this really is about counter-terrorism, not gun control. We are a nation at war against radical Islam and under increasing threats both here at home and abroad. “President Obama’s foreign policy has been a failure and helped give rise to the very threats we face. I have long argued we must do more to counter the threat abroad. However, it is also important we take steps here at home to protect ourselves as well. It’s why I supported the Collins Amendment. “Simply put — I don’t want anyone who is too dangerous to fly on a plane to buy a gun. “To be on these lists today means there is reasonable suspicion and credible evidence that the individual in question is involved with or in support of terrorist activities. There are about 109,000 people on these lists and 99% of them are foreign nationals, not U.S. citizens. There are only about 2,700 Americans who could be impacted by this measure. “I believe in due process and I was insistent the amendment contain provisions to ensure those who should not be on these lists can clear their name. We put the burden of proof on the government to show the individual is a danger and should not be allowed to purchase a gun. If the government fails, the individual’s rights are upheld and the government will pay their legal tab. “This debate will continue and I will continue to work to find common ground that both protects the rights of law-abiding citizens and prevents terror suspects from purchasing guns. The differences between the competing approaches are narrowing. “I will continue to strive to be a senator that can bring us together and find common ground in times of great threat. He’s right about continuing to strive to be a senator but all wrong beyond that. The Act isn’t about counter-terrorism or about gun control. It’s just another law and another burden on the people. Graham is correct that Hussein Obama’s policies have only made the threat of terrorism worse. To be fair though, Hussein Obama has only continued the disaster of a policy put in place by Bush 43. And Graham’s proposals on the subject, whenever he spouts off, are always of the kind which would make things EVEN WORSE. At home he says there are 109,000 people on the watch lists. Of those only 1% or 2,700 are U.S. Citizens (closer to 2.5% by my math). If 106,300 foreign nationals are on the lists of suspected terrorists, why the hell are they not rounded up and deported immediately? Neither Graham nor any other Senator really cares about Due Process. This proposal, like S.551, has a huge loophole to allow the Attorney General carte blanche authority over who goes on the list and allows the government to ultimately assert national security as an end-around to avoid due process in court. By Graham’s math that means 2,700 Americans right now could be out of luck; the list would surely grow if the Act passes into law. Don’t look for any of the foreigners to go home; in fact, more and more will just keep coming. The saddest part of all this (as if it isn’t sad enough) is that the whole thing is pointless. Gun control does not work to stop gun violence. Period. None of the criminals and terrorists Collins and Graham feign interest in stopping would be subjected to any provisions of the Act. The University of Chicago “just discovered” that criminals don’t buy guns the legal way (surprise, surprise!). So much for soft gun control controlling crime. Even hardened European gun control does next to nothing to stop gun violence. When it comes to government gun control it’s all about the state controlling citizens and about perception (image over substance). All this shows again and again you cannot trust the people who created the problem to know how to solve it. Don’t buy the gun-fly lie. 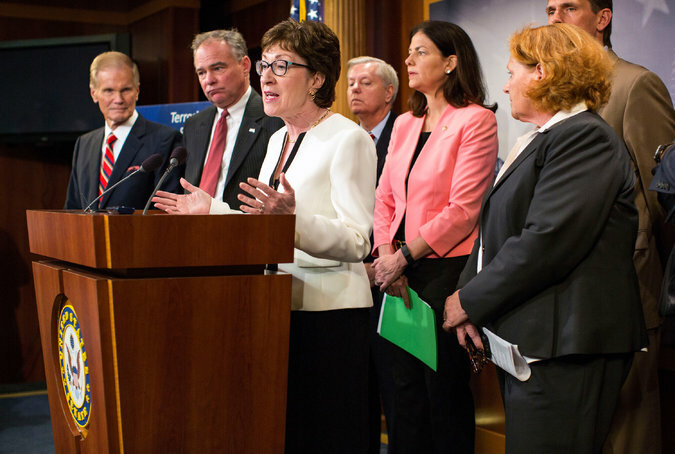 Senators propose more burdens on the People. NY Times. Three years ago Edward Snowden worked as a contractor for the National Security Agency. Alarmed by the NSA’s massive invasion of privacy and violation of civil liberties he leaked thousands of pages of classified information about the program to the public. His revelations were really nothing new; anyone with both eyes open could have learned the truth about the spy agency’s sinister agenda nearly twenty years earlier. They watch and listen to everything and everyone constantly. It’s conceivable that even as I type this article an NSA computer is dissecting it. Certainly within minutes of my official posting the electronic analysis will be completed. The whole thing will be archived. If the computer senses a threat, I will be passed on to human analysts. Most of these people spend their days on Facebook or playing video games. Usually they miss alerts. That’s good when it comes to dissenting bloggers, bad when it’s ISIS. However, if a human verfies a possible threat, an investigation may ensue. Again, if the danger is real and the investigative methods legal, it is a good system. There are plenty of real bad guys out there. As for the method, most electronic gathering is accomplished via open air interception. Anyone with a good enough scanner can capture a host of free floating transmissions. If you want your communication secure, either encrypt it, mask it, or don’t transmit it. Snowden discovered that when open intercepts aren’t enough the government will illegally wiretap and spy as necessary. The illegality comes from a lack of warrant, lack of probable cause, and a total absence of oversight. Acting as a whistleblower he disclosed this scheme to the public. As thanks the American redneckery and law and order, evangelical types branded him a traitor; the government declared him a fugitive. He now lives somewhere in Russia. His choice of refuge turns geo-politics on its head. Thirty years ago Russia was a communist dictatorship that kept the people in line through spying and intimidation. Back then America was a freer country, a proud defender of the rights of the citizenry. Things change. Snowden faces prosecution and assured imprisonment for decades should he return home. Yesterday, via video, he told a group of New Hampshire based libertarians he is willing to come back and face the music – conditionally. “I’ve told the government I would return if they would guarantee a fair trial where I can make a public interest defense of why this was done and allow a jury to decide,” he said. The whole affair is pointless to begin with. Three years later nothing has changed. No tangible evidence of damage to national security has manifested due to the leaks. Another holder of classified information, who leaked the same, is a leading contender for President. The people, most of them, never heard Snowdon’s warning in the first place. Those that heard forgot having more important things to attend – television, tattoos, football, etc. The NH libertarians are part of the .003% that get it. They represent a statistical outlier, an anomaly not worthy of official consideration. The NSA spies on, unhindered. If Snowden ever returns and is prosecuted, he WILL NOT receive a fair trial. Such things simply do not happen in 21st century America. In fact, the American courtroom is the last place one should expect to find justice. No one gets a fair trial. Most don’t get a trial period. Snowden knows this. Thus, he lives abroad. He and his attorneys have explored a plea deal with the feds. Most criminal cases end in pleas rather than trials. This is because people understand the system is so corrupt, it is usually better to accept a shorter jail term by coping to lesser charges. There have been exceptions. I recall a woman in Alabama who, faced with criminal tax charges, took the IRS to court and won. James Trafficant did the same thing in the 1980s. Both were plain lucky. Snowden is looking for something different. He asks that his trial be conducted according to the Constitution. The Sixth Amendment requires: “In all criminal prosecutions, the accused shall enjoy the right to a speedy and public trial, by an impartial jury … to be confronted with the witnesses against him; to have compulsory process for obtaining witnesses in his favor, and to have the Assistance of Counsel for his defence.” It mandates due process of law. That will not happen. The particular charges are tantamount to Treason, one of the three specifically enumerated crimes in Article One of the Constitution. I’ll give the government that solid ground. An indictment against Snowden has already been issued by a federal grand jury. Such juries used to be an independent check on prosecutorial misconduct. Today they merely indict as ordered by the U.S. Attorney, being no more than a tool of the DOJ. Defendants do not have a say in the process and the government can present any information, true or false (frequently lies) anyway it wants. Thus, fairness has already been compromised. The Fifth Amendment mandates Due Process and prohibits double jeopardy. Rest assured that if, by odd chance, Snowden beat the charges, the government could then charge him with something else. Or, they could declare him a material witness, enemy combatant, material witness enemy, leprechaun or any other term(S) they make up and just imprison him. Just because they can. They could also just kill him without pretense or explanation. Just because. In between the grand jury’s lapdogging and the double jeopardy potentially lies the trial. At trial the government controls everything. They get to present any type of evidence they like, often as a surprise to the defense. The defense is discouraged from attacking said evidence even when it is demonstrably false. The judge will move heaven and earth to keep defense friendly information out of the show. Occasionally defendants try to put the government on trial too. Judges, being government agents themselves, try to stop this. Remember, Snowden could bring in thousands of pages of documents damaging to the state. His ultimate argument could be that even if he technically broke the law, he only did so to expose worse behavior by the feds, thus he is really innocent and should be acquitted. Such argument leads to potential jury nullification of the specific law as applied to a specific defendant. This is not a theory but an ancient design, a final check against corruption where the entirety of the legal and factual circumstances are left to the enlightened determination of the jury. Judges will defy the laws of physics to try to stop this from happening. Then there’s the jury itself. Ages ago juries were a collection of intelligent men who were peers of, actual friends of the defendant. Being his friends and knowing his character they could weigh the presented evidence against their knowledge, thereby forming a reasonable judgement. Today elaborate safeguards are in place to ensure jurors have never heard of the defendant let alone be his friends. The government wants dumb submissive jurors who will easily go along with what they’re told. Modern society makes this a given. A jury is usually nothing more than twelve stupid, poorly dressed, uninterested saps who may just as well be assembled of random midnight Wal-Mart shoppers. This is the program to which Snowden would return. Sad, yes. Comical, perhaps. Fair? Anything but. Luckily, modern Russia is a pretty nice place.